This is Landon Hascue Brickey and his wife Sarah Lewis in Kentucky. Landon was born 11 Oct 1870 in KY, and died 24 Dec 1941 in Elliot Co., KY. He was the son of Parish Brickey and Mary Jane Green. 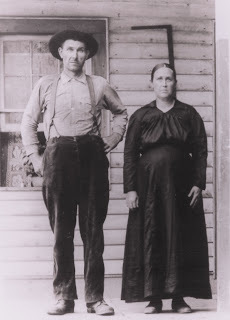 He married Sarah Lewis on 13 Jun 1889 in Elliot Co., KY. She was born 03 May 1874 in KY, and died 27 Apr 1918. He married Lillie May Laney. She was born 26 Mar 1899 in Elliot Co., KY, and died 04 Aug 1967. Landon and Sarah had the following children: Allen G. Brickey born Oct 1891 in KY, Marinda J. Brickey born Aug 1895 in KY, Hulda Brickey born 1896 in KY, Ella Brickey born Sep 1898 in KY.